The Barker is a variation on the Zippy board developed by TinCanTools (Company Website). The Barker differs from the Zippy in that the Barker has a CAN Bus interface instead of Ethernet. 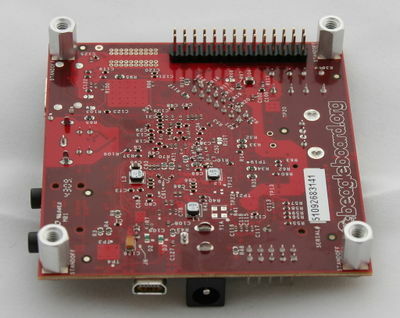 The Barker provides a standard CAN bus interface for the BeagleBoard and PandaBoard via a SPI interface using the Microchip MCP2515. The Barker provides a second SD/MMC interface that supports both 3.3V and 1.8V SD memory cards. 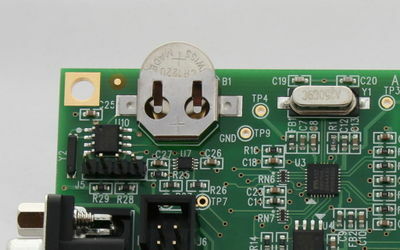 The Barker provides a second RS-232 serial port for the BeagleBoard: There are two serial connectors provided. 2x5 shrouded header (0.1 inch pin spacing). 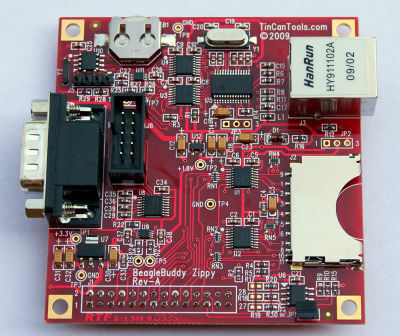 The Barker provides a battery backed-up Real Time Clock (RTC) which uses the Maxim DS1307. The backup power is provided by a small 3V lithium coin battery and is held in place by a battery holder. Insert the battery with the positive "+" side up. Slide the battery all the way into the battery holder. 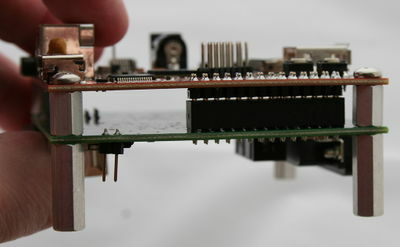 The Barker provides a 4-pin header expansion connector for access to the BeagleBoard's I²C signals. 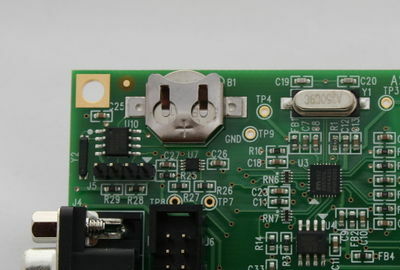 The signals have been level translated to 5V to allow easy connection to standard 5V peripherals. The Barker provides an AT24C01 serial EEPROM that contains a Vendor ID and a Device ID that the BeagleBoard uses to identify the type of board connected to the expansion header. 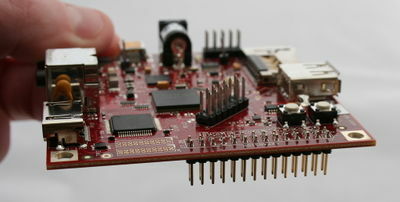 This information enables the BeagleBoard to auto-configure the pin mux for signals needed by the Barker. More information can be found on the Beagle Board Pin Mux Page. This is a quick guide showing you how to solder the 2x14 Header into the BeagleBoard’s Expansion connector (J3). Insert the 2x14 Header’s SHORT PINS from the back side of the BeagleBoard into the BeagleBoard’s expansion connector (J3). 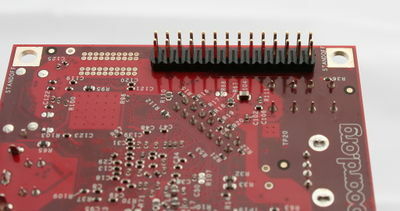 Position the 2x14 Header so the LONG PINS are on the BACK SIDE of the BeagleBoard. Solder the SHORT PINS of the 2x14 Header from the TOP SIDE of the BeagleBoard. Attach the four board spacers with the screws provided. 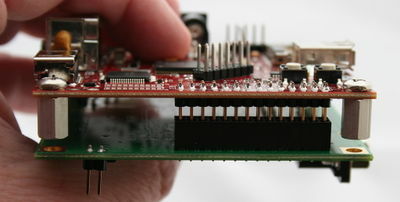 Connect the expansion board onto the BACK SIDE of the BeagleBoard by mating with the 2x14 Header you just soldered. Make sure all of the pins align correctly. Continue pushing the two boards together until the connectors mate together. Attach the male standoffs as shown. This guide will demonstate how to create a dual-partition SD card for the BeagleBoard/Barker combination to boot Linux from the first partition and have the root file system located on the second partition. This guide covers the same procedure as SDCard setup and LinuxBootDiskFormat. This guide will use a 2GB SD card for all examples. In this case it shows up as /dev/sdb (note sdb insite the square brackets above). Note card size in bytes listed above (in this example: 1967128576). Write this number down, it will be needed later below. The 239 entered in the cylinders above must be calculated based upon the size of your particular SD card. So for this example: 1967128576 / 255 / 63 / 512 = 239.156427 (use Google to calculate). So we use 239 (i.e. truncate, don't round). We use 50 cylinders of the total of 239 for the FAT32 partition above. The remainder of the cylinders will be used for the Linux root file system below. This is an important step. All work up to now has been temporary. And now copy the first three files onto the boot partition (IMPORTANT: Copy MLO FIRST! because of a bug in the X-loader which causes problems if MLO is not the first file written onto the boot partition). The next step is to extract the files in test-rootfs.tar.gz into the rootfs partition (NOT the boot partition) on the SD card. This can only be done by using Linux. Unmount the SD card from the Linux PC and insert it into the BeagleBoard's SD connector. Then boot your BeagleBoard while holding down the "User" button. How to access the SD card: If you are using the Angstrom images, then all you have to do is insert the SD card and it will be automatically mounted. To check just issue the command "mount" at the prompt to view the currently mounted devices. As long as you have a good backup battery (the small coin battery), the RTC should keep the time correct even if you remove power and boot-up the BeagleBoard at a later time. 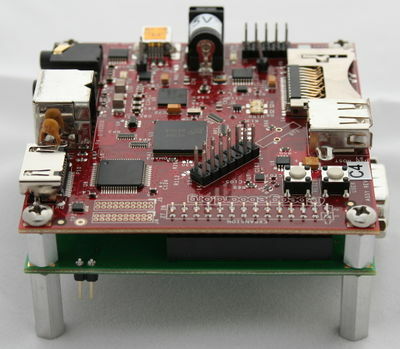 boot your BeagleBoard while holding down the "User" button. AT24 EEPROM (AT24C01B) is used to identify Barker board. See expansion board how this is done. This page was last edited on 2 May 2011, at 09:53.